Researchers have shown that a new nuclear medicine procedure could safely and more effectively detect cancerous gastrointestinal and pancreatic neuroendocrine tumors than current methods. 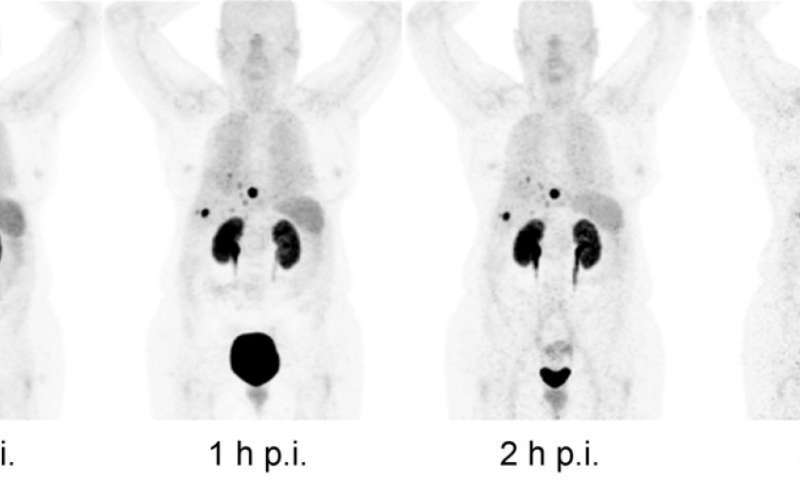 The study is featured in the June issue of The Journal of Nuclear Medicine. Most GEP-NETs express a high density of somatostatin receptor subtype 2 (sst2). These receptors have, therefore, become a prime target for imaging and treating these tumors. Currently, gallium-68 (68Ga)-DOTATOC/-TATE for diagnostic imaging and lutetium-177 (177Lu)-DOTATOC/-TATE for therapy are paired for "theranostic" identification and treatment of NETs. "Even though the effective dose of 68Ga-OPS202 is comparable to other 68Ga-labeled somatostatin analogs, there are striking differences concerning its biodistribution and organ doses such as liver, gastrointestinal tract, pancreas, lung and spleen," explains Damian Wild, MD, Ph.D., University Hospital Basel in Basel, Switzerland. He points out, "The lower organ doses and tracer uptake of 68Ga-OPS202, especially in the gastrointestinal tract and the liver, is clinically relevant, as it allows improvement of the imaging contrast (tumor-to-background ratios) and sensitivity for detecting primary tumor or liver metastases of GEP-NETs (as shown in comparison to 68Ga-DOTATOC in Phase 2 of the study, also published in the June JNM). Important for patients is that 68Ga-OPS202 was well tolerated and did not raise any safety concerns." Wild states, "68Ga-OPS202 could be a favorable alternative to the current radiolabeled somatostatin agonists in use in the clinic for PET/CT imaging of neuroendocrine tumor patients. In addition, due to their enhanced binding properties, radiolabeled sst antagonists may open a new avenue for PET imaging and targeted radionuclide therapy in non-neuroendocrine tumor indications. In that sense 68Ga-OPS202 is the ideal theranostic companion for 177Lu-OPS201 targeted radionuclide therapy."